You'll never be more alive than you are right now. A day from now, you'll be older. Your body will be older, your cells will be older. You'll be closer to physical death than you've ever been before. An hour from now, you'll be closer to death. A minute from now. A second. So do the good you can while you can! --and is the only mystery. Just wanted to give you a heads-up on my weekend plans. I'm leaving tomorrow morning to travel with Amanda and Gundi to a German Ladies' Retreat at Bergkirchen, near Hannover. The organizers for this retreat are the ladies from the church in Kiel, and they asked me to to a speech/talk/sermon/whateveryouchoosetocallit. My topic is "Trusting in God." Since I've never attended this particular retreat before, *my task* is trusting that God will give me the right words to say. Strangely enough, I'm not nearly as nervous about speaking as I was before the Filzmoos Retreat in September. Don't know if that means that God imbued me with more peace of mind, or that I'm well-prepared, or that I'm just overconfident. why, oh why do i do this? It's 12:25 in the morning. I should be in bed, asleep, or at least getting ready for bed, preparing for sleep. I'm going to end up sleeping until 9 a.m. because I must get my minimum eight hours per night, and I'm going to be irritated with myself most of the day for going to bed late and then sleeping through half the morning. Ed is watching football, which is weird because he never stays up this late. Except that he's been staying up this late a lot recently, which is due to my bad influence (I think) and the availability of American TV through Matt's slingbox. I, on the other hand, am putting off going to bed by reading Wil Wheaton's blog, all because he was one of my favorite actors on ST:TNG years and years ago. Is that weird of me? On Friday I'll be traveling to northern Germany to a German Ladies' Retreat, where I'm to do a lesson/sermon/speech/whatever on trusting in God. And I'm not even done writing it yet. *sigh* I'm going to bed now. I think you are exaggerating... Everything I need is in my soul? The Heck it is! Or if so, it must contain a great many virtues and a great deal of wisdom which neither I nor anyone else could ever find there. Very little of what I need at present is in my soul. I mean, even things of the soul's own sort, like humility or truthfulness. And it certainly does not in any obvious sense contain a number of other things which I need at the moment; e.g. a stamp for this letter. Never exaggerate. Never say more than you really mean. So much for the popular belief that we humans can be completely self-sufficient. So much for New-Agey metaphysics. We need to quit saying of ourselves "I AM" and start focusing on the One who really is. Christ's life is the way to greater happiness. Helen Keller, blind all her life, was nonetheless typical of Jesus' followers when she said in her later years, "Life is beautiful." Napoleon, on the other hand, after conquering all of Europe, said, "I've never known five happy days in my life." There's a quiet power in living a Christlike life. ...Napoleon observed that he, Alexander the Great, Caesar, and Charlemagne had all founded empires based on force. Jesus, however, founded His kingdom on love and humility. Today there are millions who have committed their lives to Jesus and would probably die for Him. How many would die for Napoleon or Caesar? So which is the greater power? "How To Get What You Want and Want What You Get"
I know none of us can say with 100% certainty what we would do in a given hypothetical situation. However, I can say with complete assurance that I would never willingly give my life for a government, a nation, a system, an institution, or an organization. Nothing manmade is worth dying for. And though I haven't been tested in this regard, I do think that I would be willing to die for Jesus. I can't imagine ever believing that keeping my physical life is worth denying Christ. I can't imagine ever wanting to give up eternity with God in order to keep my physical life. And yet, even with these high ideals, I still have trouble giving up my human desires. I still find it almost impossible to separate my real needs from my perferences, my mere wants. Last week, I said that I needed that new pair of jeans. After all, my other pairs don't really fit properly. But no, let me be honest: I didn't need the jeans, I just wanted them. I don't need the new bed, I just want it. I don't need to wear makeup or get another degree or go to movies regularly or be able to flit back and forth between Oklahoma and Germany....I just want to. Are you in prison? You are if you feel better when you have more and worse when you have less. You are if joy is one delivery away, one transfer away, one award away, or one makeover away. If your happiness comes from something you deposit, drive, drink, or digest, then face it--you are in prison, the prison of want. Yep. I'm in it. I keep getting paroled, God keeps bailing me out, but like a moron I keep running back in, like the criminal who can't handle living in the real world. 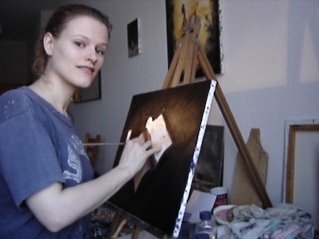 Here I am working on my latest painting. Bad angle, can't see much. But at least you're getting something of a view of the magic in progress. Ha ha. And here's the painting itself, as it is so far. The title will be "According to the Dove on Far-Off Terebinths." Funny, since there aren't going to be any terebinths in the painting. Terebinths are trees, if you were wondering. My inspiration for both title and painting came from Psalm 56. In the English Standard Version, the intro to this psalm mentions the doves and terebinths. And verse 8 reads, "You have kept count of my tossings; put my tears in your bottle. Are they not in your book?" 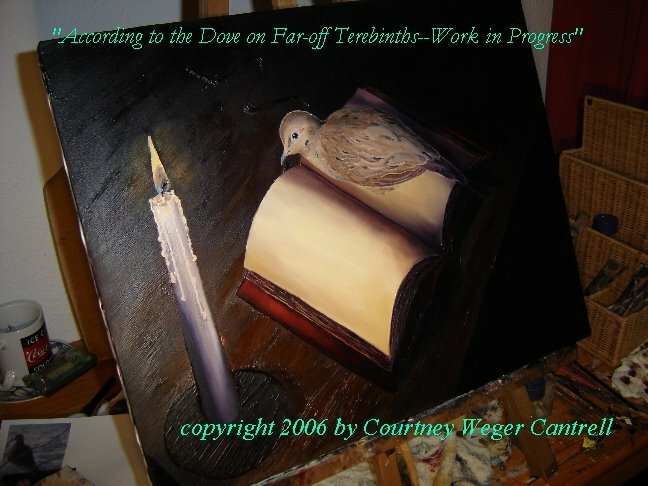 Hence, the painting will eventually portray the dove's tears dripping into a bottle drawn on the book's open page. So far, I'm pleased with the way everything's turning out. Except for the candle, which I dislike immensely.